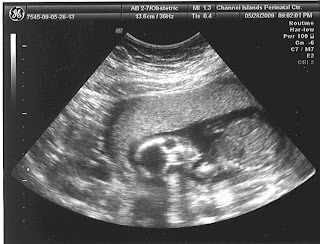 We decided that we wanted to try to get pregnant, it was just time, we both wanted children and maybe the timing was not perfect, but it felt right. It was a bit of a hard time, I had just had the company I was working for shut down and Tony was switching jobs, but hey, we like to live on the edge! Oh yeah and we were moving and my Dad’s office was moving! 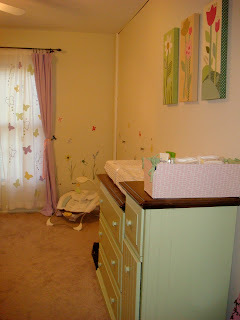 Well the morning of February 21, 2009 we got up for our big move day for our house, I was throwing up. We thought well maybe but this is too soon, and plus I had been really stressed, packing, and preparing. Everything was arranged, organized, and ready to go. The movers were coming, people were coming to help us, and well sick or not here we go! Moving went great and the next day we went over to Target and bought a test. Sure, enough we were pregnant, and so our journey begins. We were both soo excited, I can not describe our feelings were were happy, scared, and overjoyed all at once! We took this picture and I think it describes in a silly way how happy we were! After all, we were having a baby!! We had our first Doctor’s appointment at 8 weeks, then we decided to tell everyone (which we wanted to wait another couple of weeks to do-but people unfortunently started guessing...). Telling everyone was a little bit of a relief, I mean I started to have the nausea hit in at about 8 weeks, and I was tired!! We got to have our first ultrasound at 9.5 weeks, we were VERY excited!! It was excellent to see and hear the baby heartbeat, it made everything REAL! This is where you got your name peanut, because that is what you looked like, but we loved you! May 8, 2009 was the first day I felt you moving around in my tummy, you felt like bubbles, popcorn popping, or a goldfish swimming in my belly, I just remember being in the car and I just got the biggest grin on my face, I was 15 weeks pregnant. 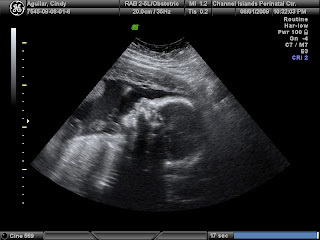 I remember around this time we were very anxious to know whether you were a baby boy or a baby girl. 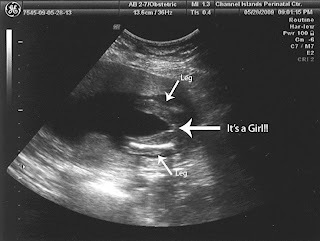 I really thought you were a girl, and your Daddy also thought you were a girl, although 2 weeks before the ultrasound we both did not know, so we kept changing our minds. Mother’s Day this year was very special, it made me think about being your Mommy, as well as how amazing my Mommy is! I love her very much and she is my best friend. I hope I will get to have a great Mommy daughter relationship. Your Daddy spoiled me and us, he made me feel like the most loved wife and new Mommy. 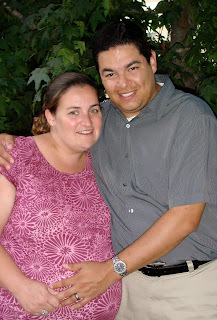 On May 28, 2009 we found out we were having a baby girl!! Your Daddy and I were sooo excited!! We shared our good news with everyone, it was amazing to see you via ultrasound! It was very apparent due to your positioning, so we were more than excited!! 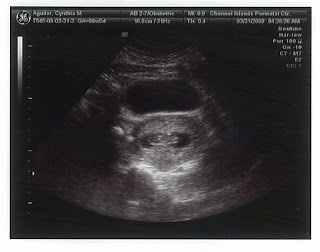 At the time of this ultrasound I was 18 weeks pregnant!! After we went to our ultrasound Tony took me to dinner and then we went together to pick out some baby GIRL clothes, of course cute little dresses and such!! 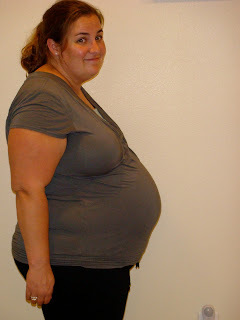 At 20 weeks I started to feel much better, the nausea started to subside, and you were moving around a lot!! Your Daddy was very excited to feel you in my belly, but he would have to wait. 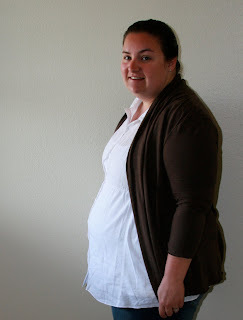 My belly started to grow and around this time I transitioned to maternity clothes...phew!! 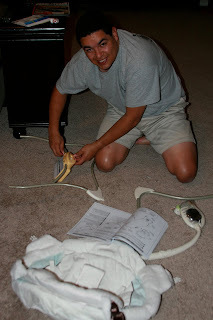 At this time, your handy dandy Daddy was helping to put together all your fun stuff, he was awesome, in seconds everything was assembled and ready for you to use. 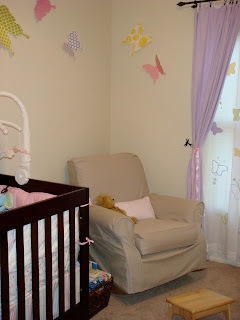 Here are some pictures of your highchair and bouncer seat! Around this time we also slipped in a little trip to Tahoe, it was fabulous as usual!! 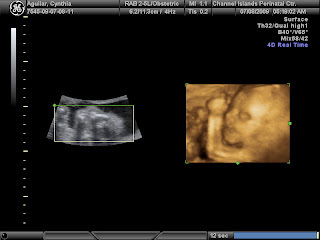 At about 22 weeks, your Daddy finally felt you moving around, he had a big smile on his face, it made me smile also. 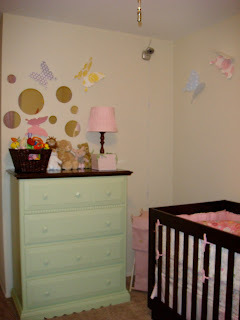 We started to work on your baby room around this time! 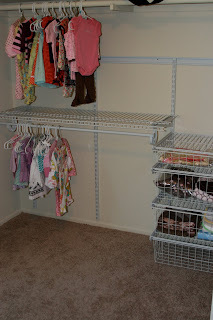 Your Daddy installed a closet system for you and we were happy to have the extra storage!! 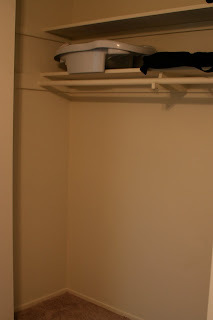 Here are the before and after pictures! 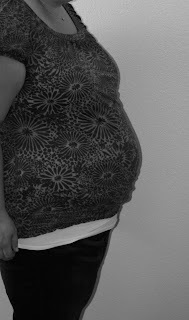 On July 7, 2009 we were very excited, we had our 4D ultrasound, I was 24 weeks pregnant!! We invited my Mom to join us, and I think she was as excited as we were to get to see you!! 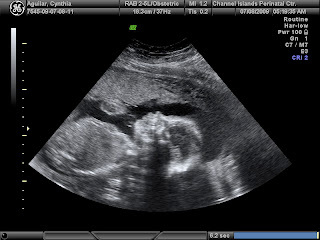 Although your positioning was as usual not very good, we were all fascinated to see your heartbeat your hands moving around, your little feet, and your facial expressions!! We got our first profile shot of you also, we were in awe!! 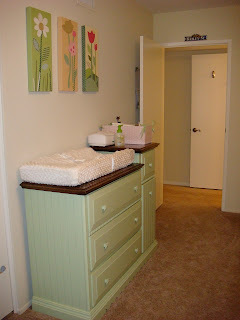 We started to really work on your room and plan when we found your dresser and changing table on Craigslist! 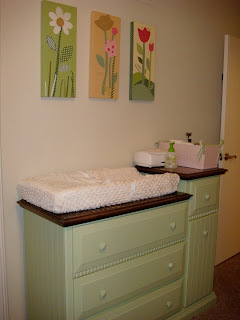 We decided to re-do the top to match your crib! It turned out to be a fun project, and for our first time doing this, I think we did pretty well. 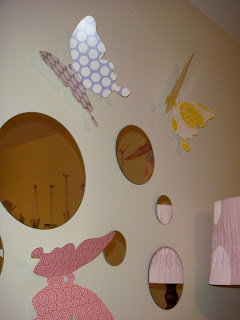 At this point I had your room scheme picked out!! We had a fantastic Baby Shower hosted by your Aunt Laurie and your Grandma Sandy on August 8, 2009. It was beautiful and the food was fantastic, Thank you to your Grandma Sandy and Farrin!! Aunt Laurie and Grandma Sandy did a great job with the games, favors, and decorations!!! Most of our family was there and it was a fantastic day! You were spoiled and got soo many cute things! You will be very stylish!! As we approached 31 weeks everything is going very smoothly and we are on track. 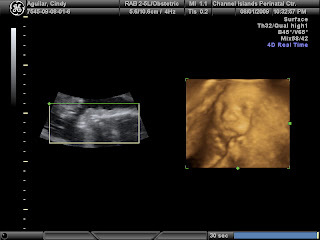 You are measuring on schedule and is a healthy little girl so far. Your Dad and I enjoy feeling you kick and move around in my belly, seeing my belly “vibrate” and your kicking is funny, it makes us laugh!! We feel fortunate that you are healthy and everything is going smoothly!! 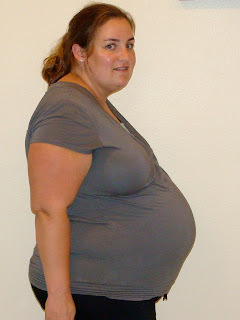 Here is you and I at 31 weeks along!! 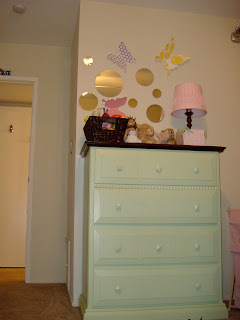 Your room has kept as a work in progress, I have always been into decorating, so I am sure your rooms will always be coordinated!! 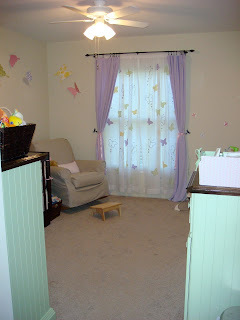 We really hope you like it, both your Dad and I along with some friends have worked on your room. 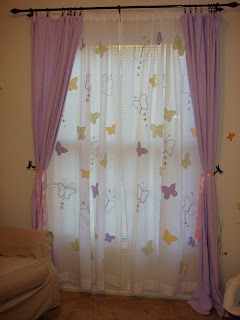 Auntie Maddie and I made your curtains, and they are perfect!! 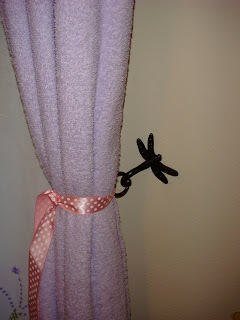 In September your Great Aunt Donna and Margaret threw a couples baby shower and thank you to Great Grandpa Thomas for using his home, it was a nice day and we enjoyed having fun! 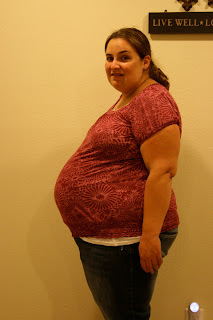 Here are some photos of you and I from 35, 36, and 37 weeks! I felt huge! 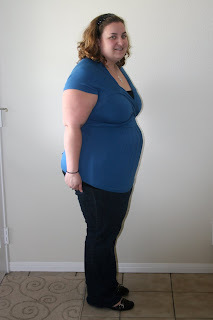 Although I had only gained about 11 pounds total!! 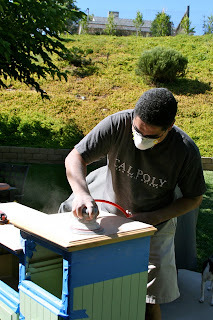 It is exciting to know you are growing healthy in your “Baby Bake Oven” or “Bailey Bake Oven” as your Daddy calls it! Oh yeah, he also calls it the Baby house, Baby Condo, and graduating to Baby Mansion, this is your Dad though, he is always making me laugh! 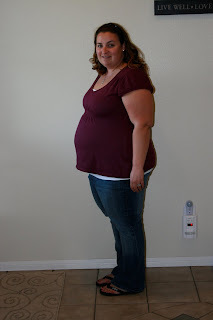 Once we hit 38 and 39 weeks, I started to get uncomfortable, and honestly I am ready for you to come out. I feel like I am expanded to the hilt now!! I love feeling you, and your Dad loves to feel you move also! We are VERY excited to meet you. I have to admit that I am a little nervous, but that is to be expected!! I hope you are healthy and that everything goes okay when you are born for both of us!! 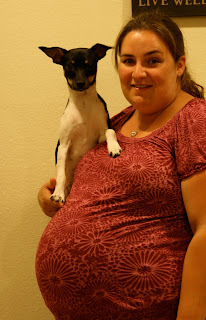 Here is you and I at 38 and 39 weeks!! So as of today we have 2 days until your due date. We are both very anxious for you to come. Waiting is getting hard. 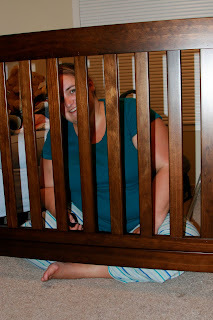 I will miss having you in my tummy, moving, kicking, rolling around. I will miss your Daddy putting his hand on my belly everyday talking to you, and at night trying to feel you kick, which made him so happy. We wonder every day what you will look like, who you will look like, but ultimately we know you will be our beautiful baby girl. We hope that we can provide you a great life, and a happy one. When you look back at this someday, we hope you will know that you are loved and that we are soo excited for you to come. After all in the next week we will be a family, graduating from “Couple” to “Family”. We are more than excited for you to meet your family and our friends, there are so many people here waiting for you to arrive. I know that even though I will miss you being with me in my tummy for the last 9 months, the experiences that we will have after you are born are unforgettable and life changing. I am excited to see all your firsts, especially seeing you with your Daddy. I love your Daddy with all my heart and I know you will also, he is a great person. We both can not wait to hold you in our arms, I know it will be love at first sight, I think that love at first sight really does exist. We can not wait for your arrival Bailey, and just know you are loved!! So, yes this is me resentfully resting having a grand-ole-time!! I am pretty uncomfortable, I have to say this week. With my feet swelling I have “cankles” at the end of the day, my hands puff up, my lower back hurts, indigestion is often bad (something I have never had in my life), sleeping-ha ha and pressure pressure..ugghh...there all in one complaint! Sleeping has become a bit overrated as I can not get comfortable whether it be from indigestion or cramping, bathroom trips every hour or soreness, if it is not one thing, it is multiple things...! Like right now it is 4 am in the morning...and I just can not sleep, so catching up on my journal it is! I will go back to bed though. and I did get a couple straight hours in, so that is good. It was funny bacause my sister had just asked me if I had any swelling and I was like “nope” and the next day, I swear...It happened. Tony has been an awesome help putting up with all my complaining these past 2 weeks, I remind him that luckily we have been blessed this whole pregnancy with uneventfulness!! We both think that I have carried this baby well, yea, a positive note. Well I now get nightly foot massages and hand massages, which feel wonderful! Bailey is moving around a little less, but she has always been rather calm!! I was soo happy, my Mom finally got to feel not only her hiccuping but her moving around and kicking (not her hardest kicks, but...It was cool!)!! Laurie also got to feel her kicking around while we were out to dinner!! She hiccups like 2-3 times a day, we feel bad for her, but I have read that it is good, I guess to hiccup your central nervous system must be in tack, and also the baby is practicing breathing! So you go Bailey! This week my mom and I had a day to hang out, which was nice, we had lunch, then went to the fabric store. We then went home and made some pumpkin cookies, yummy!!! After that we made Bailey two bibs, they are soo cute! I need to take a photo of them!! Other than that, just doing last minute things, hanging out with Tony, and playing with Roxy girl! She is a doll! She is doing so well, Tony is teaching her to catch the frisbee right now, she is soo close!! She is also staying at home by herself finally which is a BIG thing for us, we do not have to take her with us when we go!! 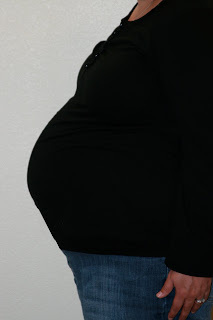 By the time you are 38 weeks pregnant, your baby is considered "full term." In other words, if your baby were born today, he or she would be considered a full-grown baby. 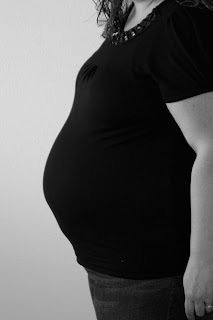 At week 38 of your pregnancy, your baby is approximately 19 to 21 inches long from head to toe and can weigh nearly 7 pounds. This is the scoop according to the websites this week! So what is fun going on this week (I am behind on writing so I will be writing from the future (ha ha!) I went to my weekly doctor’s appointment this week, and boy what an exciting time. So the usual weigh in...okay so total in my pregnancy I have gained 10-11 pounds before this doctor’s appointment...well to my shock I go to step on the scale and I have gained another 1-2 pounds...okay so they do not care at all. So I go in the room with the nurse as usual she asks the brigade of questions...swelling in the hands= no, swelling in the feet= no, Braxton hick contractions= not many, feeling okay= yeah as good as can be expected. Then she goes to take my blood pressure, this is where everything goes downhill in the temporary moment...Now, my blood pressure has been perfect the whole pregnancy and even before, luckily I have just never had issues with it at all! I usually run like 119/ 72 or so...So I relax looking out the rainy window at the hospital in which I will be delivering in listening to some kind of music that is bluegrass maybe, kind of loud (but my OB always has trendy music on--but this time, I can not take it!). When my doctor came in he said Bailey has a perfect heartbeat, which makes me smile! That is all that matters! Proceeds to tell me that it is a good thing that my blood pressure went down because not only would they not let me leave with it high, they would induce me then and there...ha ha...no! Although it sounded tempting to hold a baby the next day :)! He told me to REST, check my blood pressure if I think about it, to put my feet up, and take some small walks and he would check me next week. Oh yeah and he checked me and no progress in the dilation world but she is head down and low. Maybe next week! Tony made me march to CVS that night and check my blood pressure, it was great as it continued to be all that week! Yea! So I made my trips to CVS every morning, and borrowed my grandparents blood pressure machine also, All is good thankfully! WW- What the Ergo is Really Made For!! 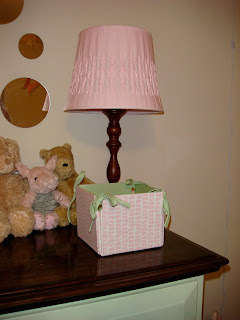 Blog Hop Friday- Cupcake time!